Dr. Sands is a 2018 graduate from Purdue University’s College of Veterinary Medicine. She is originally from southern Indiana near Patoka Lake and the Hoosier National Forest. 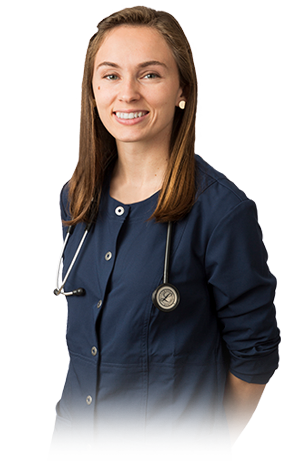 She enjoys all aspects of veterinary medicine with special interests in nutrition, dentistry, small animal reproduction, and client education. Dr. Sands enjoys spending time with her two Australian Cattle Dogs, Rue and Pippin, and likes to take them kayaking, hiking, and camping. One of her long-term goals is to raise sheep and train her dogs to herd them. She also enjoys horseback riding, spending time with family, and watching TV shows and movies such as Parks and Recreation and Lord of the Rings. Pets are her passion and she strives to improve the lives of both her patients and their families.